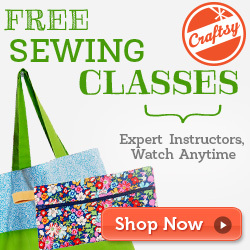 I always love being part of the Craft Lightning Series hosted by my blog friends Angie from the Country Chic Cottage & Carolina from 30 Minute Crafts and I was especially thrilled to hear about this one showcasing Recycled Crafts! As most of my regular visitors already know...I love to make things from materials that would otherwise be disposed of...so this edition of Craft Lighting is right in my wheelhouse! One of the things I "collect" and mean to someday USE...is cardboard toilet paper and paper towel rolls and my hubby always wonders WHEN I am going to use some of them up and unburden us from all the mass of cardboard! 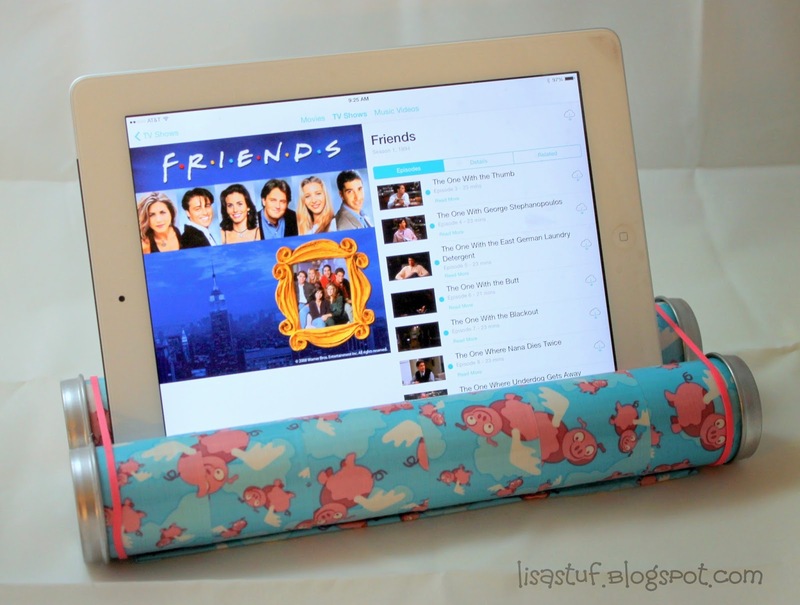 The idea for this came out of necessity really...as we do a lot of traveling to auto swap meets and races in our Motorhome and I like to watch episodes of my favorite TV show of all time (Friends) on my iPad when I am going to sleep. I have never found a good way to get the iPad to sit-up on the bed in the MH, even with one of those pad covers that is supposed to make them stand up. The mattress is just too squishy and it never stays up! 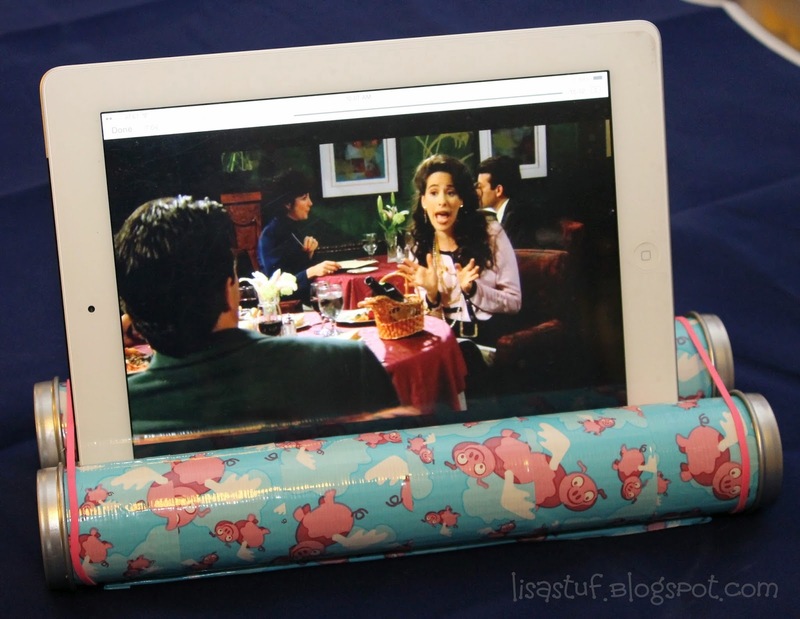 So I tried to think of something I could make that would keep the iPad upright and still let me view the entire screen. 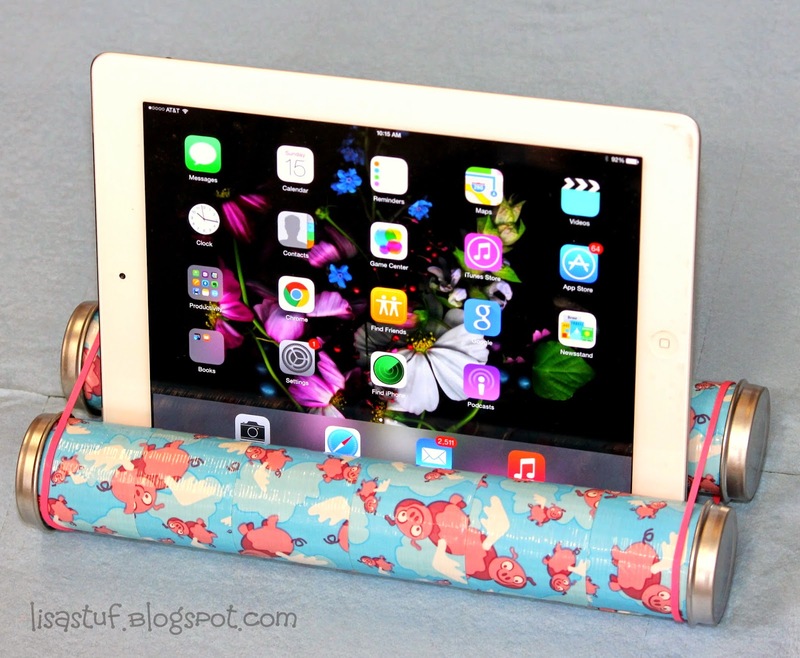 For some reason the cardboard rolls popped into my mind...I figured if I could put two of them side-by-side and somehow secure them to hold the weight of the iPad then I would have a good solution to my problem and it would be a "recycled" craft! I picked the brains of my family a bit for ideas on what would work best to stabilize it and we decided on rocks and rubber bands! The rocks give it weight to balance out the weight of the tablet and the rubber bands keep the glued down rolls from taking on too much pressure from that weight. 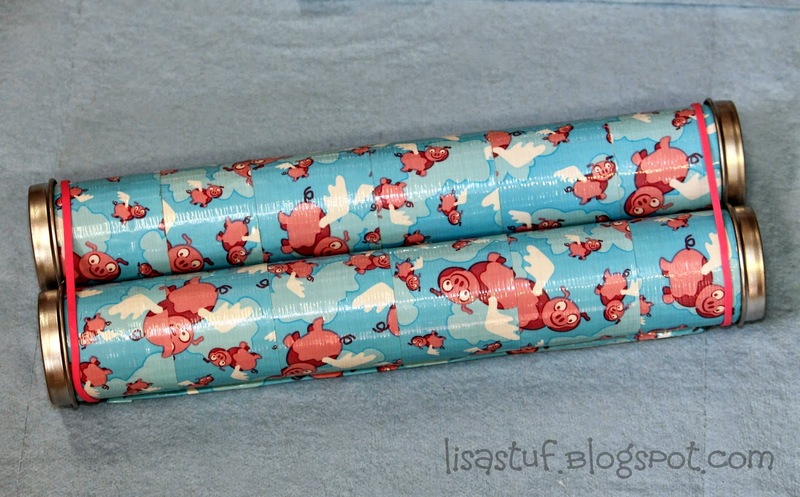 I covered the cardboard tubes in duck brand duct tape to strengthen the cardboard and make it look prettier of course! I made the base from an old Capri Sun cardboard box because it was a fairly thick cardboard and would hold-up well. I covered the base in duck tape also for added strength. I glued the covered rolls down on the base using E6000, which I recommend because of it flexibility, even after it has dried. Some heavy duty glues can become very hard when dry and would not work as well for this project, but the E6000 performed great and allows for any pushing/pressure that may be put on the rolls. I tried to put an even weight of rocks into each tube, I didn't weigh them, but just tried to pick 10 rocks of similar size and put 5 rocks in each tube. You can glue these down inside the tube if you like, but I did not. I left them loose and just shake them slightly to align evenly before I put the iPad in between the tubes. To seal off the tubes I used old baby food jar tops spray painted silver to compliment the colors in my Flying Pig Duck Tape. After letting the glue on the tubes and base set for a bit I put shims in between the tubes and let it dry overnight. (This was to be sure that I had some extra flexibility with the size of the slot to input the tablet.) 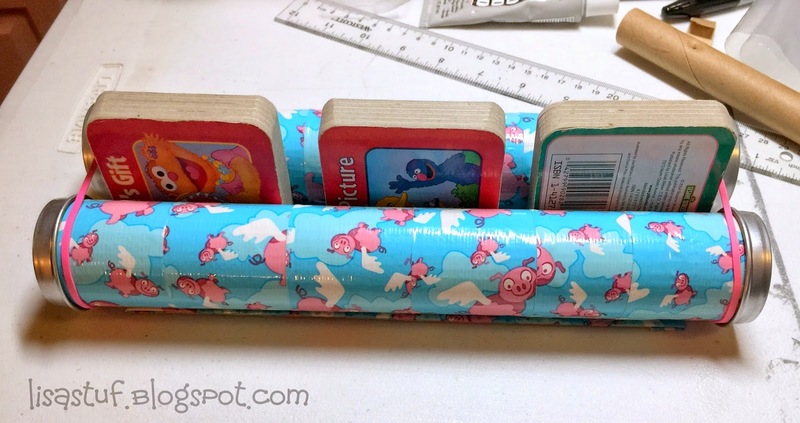 For shims, I just used some mini cardboard baby books that I have on hand for my Grandchildren, but you can use thick pieces of cardboard or wood shims if you have them. This project came together fast (minus drying time) and was so easy! 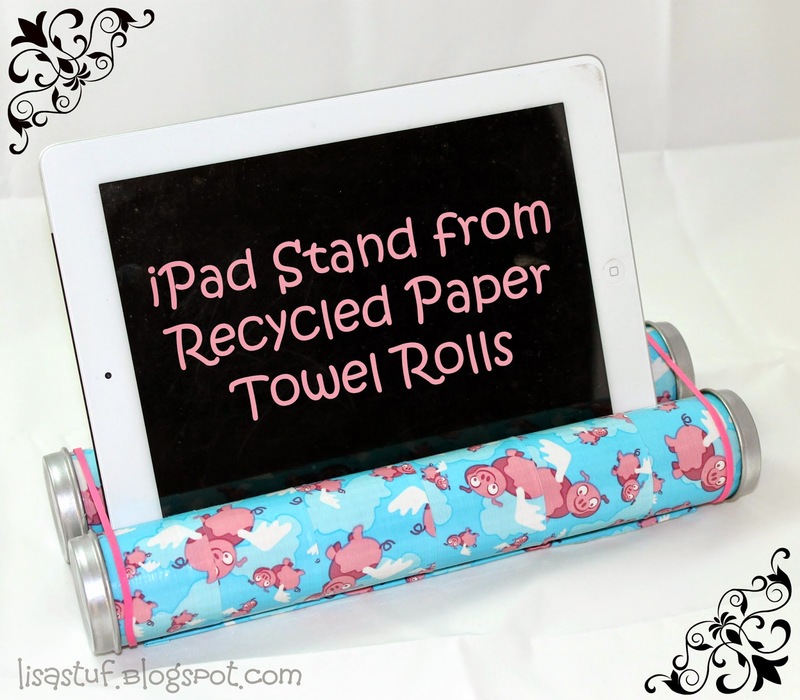 I recycled three different items (cardboard tubes, baby food jar lids & a cardboard juice box) that would normally be thrown away and the best part is...I made something I really needed and saved some money (have you seen the price of iPad stands??!! Yikes!). 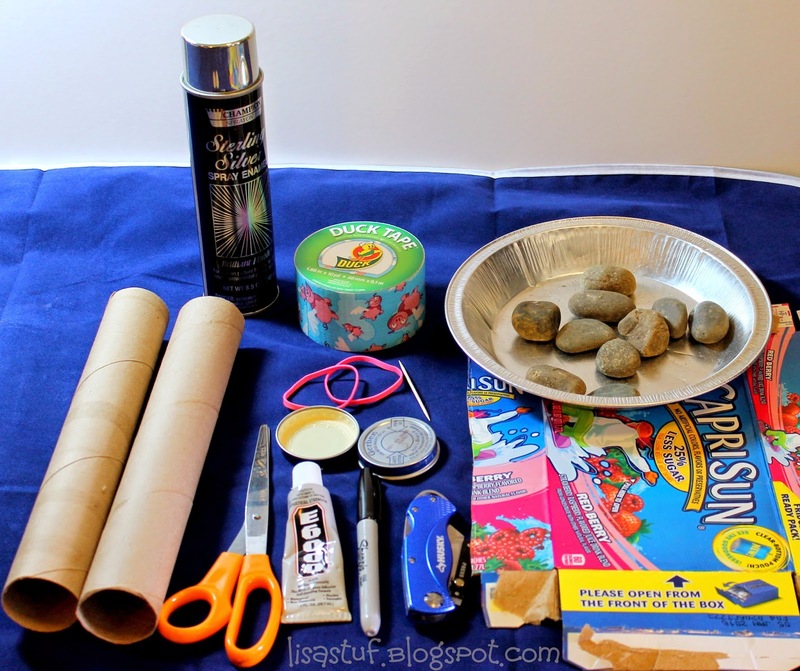 Cardboard Tubes (from Empty Paper Towel Rolls) - 2 ea. Small Smooth Rocks, 10 ea. Baby Food Jar Lids, 2 ea. Hope you enjoyed my post and are inspired to create something from recyclable or throw-away materials! 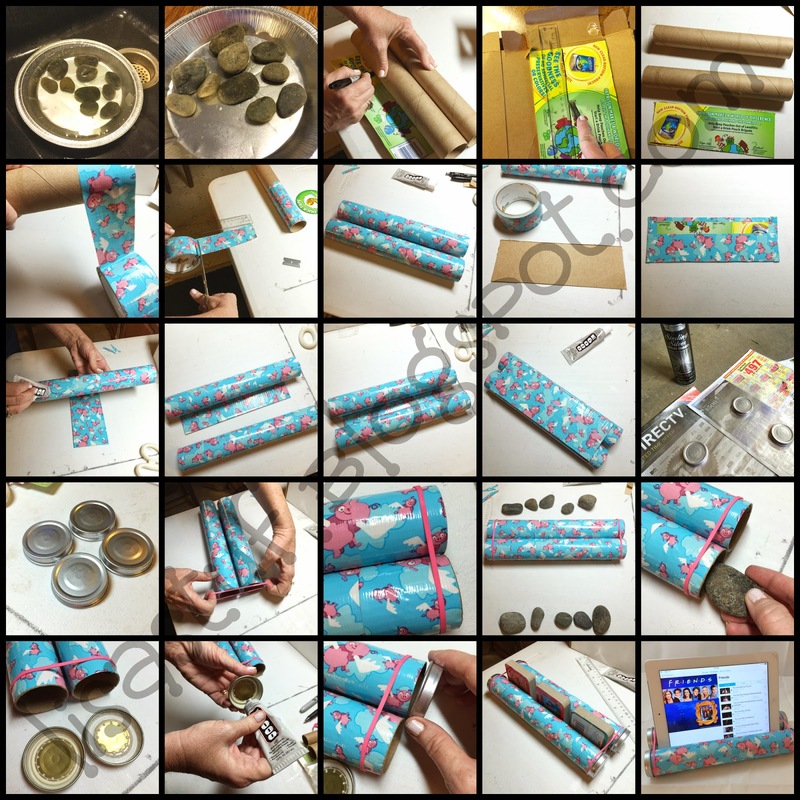 For more crafty, recycled inspiration be sure to check out all the cool projects featured on the blogs below by clicking on the graphic.